A freshly molted fifth instar monarch caterpillar consumig the Asclepias curassavica flower buds. As a child, Juliana Danaus spent endless hours playing with monarch butterflies in her grandmother’s tropical milkweed patch on Faria Beach in Ventura. Danaus was mesmerized as she watched her grandfather relocate chrysalides from the outdoor plants to inside the home, where they would watch each one come out of its chrysalis, dry its wings and fly off. Years later, after the death of her grandparents, Danaus picked up her grandmother’s torch. Today she is known as the Monarch Mama and founder of Monarch Arc, a not-for-profit effort launched in 2014 that focuses on the needs of the monarchs and their essential milkweed required for survival. Monarch Arc is volunteer-based, and doesn’t sell anything or charge fees for services. “I’m a monarch mama — I foster the monarchs until they’re ready to go. And if they can’t go, I either do the best I can to give them what they need or I help them along the way over the rainbow bridge,” Danaus said. Monarch Arc’s slogan is: to help the monarchs thrive not just survive! In addition to her hands-on experience from nearly a lifetime of being surrounded by monarchs and milkweed, Danaus is certified in Lepidoptera disease prevention through the Association for Butterflies. She also has certification through the International Butterfly Breeders Association for the prevention of Ophryocystis elektroscirrha, a parasite that infects monarch and queen butterflies. She is also a “citizen scientist” who reports to Journey North, Monarch Watch, the Monarch Larva Monitoring Program, butterfly farms and U.S. Fish and Wildlife. Since Danaus started Monarch Arc, she has established monarch way stations in Ojai at the Ojai Valley of the Moon Community Garden, the Ojai Police Department, and her apartment in town. Each waystation is home to several different species of milkweed, the only host plant a monarch family member can munch as a larva or caterpillar. Although most milkweeds are an Asclepias species, others are Cynanchum, Gomphocarpus and Oxypetalum, Danaus explained. Milkweed is named for the white, milky sap that oozes when the plant is damaged, cut, munched or otherwise “attacked,” as the plant perceives it. She further emphasized the importance of knowing the source of milkweed before planting. Danaus visits people’s homes for free to help them establish butterfly gardens, explain how to raise healthy “flutter-bys,” and help disinfect whatever needs to be disinfected if pathogens are a problem. Monarch Arc monitors and reports milkweed activity, actively searches for new milkweed patches in the wild for calflora.org and bonap.net, and harvests eggs and caterpillars to keep parasitoids and predators from making a meal out of the monarch. Volunteers with Monarch Arc establish habitat activities and help plant milkweed, as well as educate students from preschool to high school, gardening groups and home-schooled students. Education, inspiration, empowerment and conservation are the priorities of Monarch Arc’s purpose and mission. Many hands-on hours are spent empowering and educating people, even when they won’t plant milkweed, she added. 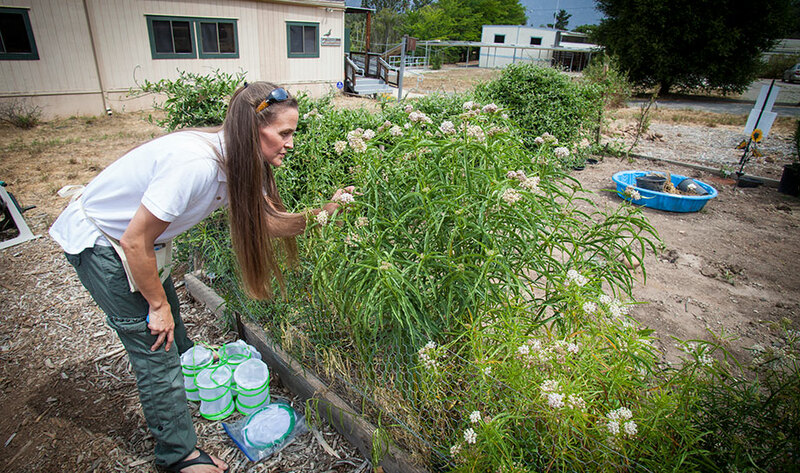 Juliana Danaus checks milkweed growing at the Ojai Community Garden. Monarchs and other butterflies are more than just a pretty sight. They are in fact essential pollinators in the ecosystem, especially of North American native flowers that only butterflies with their long proboscises can reach deep enough into the blossoms to pollinate them. Also, because bees are generally restricted to a local area, many butterflies are able to cross pollinate over a larger area to improve the genetic mix of genes among the flora. The United States Department of Agriculture has permitted the interstate shipment of two species of butterflies for release — the monarch and the painted lady butterflies. Because the two types are both migratory, they move pollen grains among blossoming plants both in the spring and the fall. While monarchs and the painted lady butterflies are not endangered, their migratory environments have been considered threatened. The release of butterflies is a proactive effort to ensure a stable and growing population of the species. In the spring of 2014, the Ojai Police Station, in partnership with Monarch Arc, planted several different types of milkweed in various planter beds surrounding the station. Within a week, the first monarch caterpillars appeared. The Ojai Police Station was designated as Monarch Way Station #10146 by MonarchWatch.org. The project was made possible through local donations, and there were no expenses paid from taxpayer funds, Donoghue noted. He emphasized that the effort is also environmentally sound because the milkweed plants are drought-resistant. According to the Xerces Society for Invertebrate Conservation, monarch butterflies of North America are renowned for their long-distance seasonal migration and spectacular winter gatherings in Mexico and California. The monarch butterfly population has recently declined to dangerously low levels. In the 1990s, estimates of up to 1 billion monarchs made the epic flight each fall from the northern plains of the U.S. and Canada to sites in the oyamel fir forests north of Mexico City, and more than 1 million monarchs overwintered in forested groves on the California coast. Now, researchers and citizen scientists estimate that only about 56.5 million monarchs remain, representing a decline of more than 80 percent from the 21-year average across North America. “This is an alarming statistic,” said Donoghue. A press release prepared by Donoghue in April 2015 noted that habitats typically consisting of various types of milkweed have been destroyed on a massive scale. Now, patterns of climate and weather are shifting unpredictably in response to pollution of the atmosphere — but the disappearance of these beautiful creatures is more serious than just a loss of color in the countryside. The Ojai Police Station accepted an invitation to be the first police station — and currently the one and only — to certify and register as a Monarch Watch Way Station, Danaus said. “There are well over 10,000 way stations, but only one is also a police station,” she said. The community garden waystation was established in 2014 by numerous volunteers who dug and schlepped dirt, stapled hardware cloth in the bed frames and donated supplies. One volunteer even disassembled the bed frame at his home and reassembled it as the big bed frame for the milkweed. “When I teach classes and I can’t come up with enough supplies on my own, the community of Ojai has been extremely generous, sharing with Monarch Arc,” Danaus said. The Ojai Valley of the Moon Community Garden is a project under the Ojai Valley Green Coalition, whose mission it is to advance a green, sustainable and resilient Ojai Valley, said Heather Mohan-Gibbons, garden manager. The garden is private property and access to the land is possible by becoming a member of the garden. The monarch way station is beneficial for both the garden itself and the community, Mohan-Gibbons noted. For instance, the plants serve as consistent pollinator sources for many butterfly species, bees and hummingbirds. Additionally, the garden is organic and there are no citrus trees on the property so it creates a safe oasis for pollinators. “Pollinators have intrinsic, aesthetic, educational, scientific value, are indicators of a healthy ecosystem, and can help scientists track climate change,” Mohan-Gibbons said. The monarch way station also allows educational opportunities for the community, school groups, research and plant cultivation and seed-saving of rare California native milkweed plants. A single mother, Danaus said she is first and foremost a mom of a 3-year-old daughter and 9-year-old son, who live with her in Ojai. For more information or to contact the Monarch Mama, Juliana Danhaus, see Monarch Arc on Facebook at www.facebook.com/Monarcharc/ or call her at 798-5650.